Taking its cue from for-profit corporations, the nonprofit world has increasingly turned to commercial-style branding to raise profiles and encourage giving. But it hasn't worked. 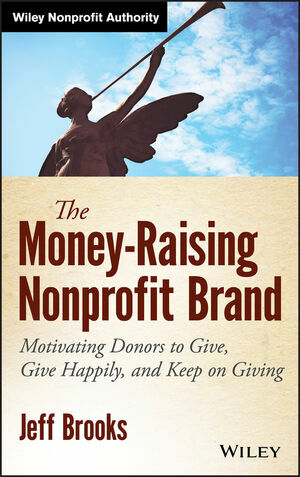 Written by a longtime industry insider, this book argues that branding strategies borrowed from for-profit companies hasn't just failed, but has actually discouraged giving. But why does branding—a well-developed discipline with a history of commercial success—fail when applied to nonprofits? The Money-Raising Nonprofit Brand + Website argues that commercial-style branding is the wrong tool applied in the wrong way to the wrong industry. Nonprofit fundraising is a fundamentally different world—financially, emotionally, and practically—than commercial marketing. Here, the author explains why commercial marketing strategies don't work and provides practical, experience-based alternatives that do. JEFF BROOKS, creative director at TrueSense Marketing, has served the nonprofit community for more than 25 years, working as a writer and creative director on behalf of top North American nonprofits, including CARE, St. Jude Children's Research Hospital, World Vision, Feeding America, World Relief, and dozens of urban rescue missions and Salvation Army divisions. He blogs at futurefundraisingnow.com, podcasts at fundraisingisbeautiful.com, and is the author of the popular book The Fundraiser's Guide to Irresistible Communications (2012). He lives in Seattle.